Liam Gillesphey’s first-half header was enough to see off the title-chasers on Saturday afternoon and rewarded another impressive display by The Star, despite captain David Robinson’s 54th minute dismissal. It may have been against the odds, but it still felt like this day had been coming for Seaham. 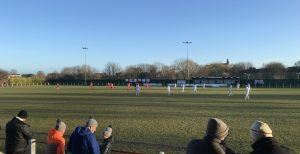 Their last-gasp defeat to Bishop Auckland a fortnight ago was an immensely harsh outcome on a day when the performance possessed all the hallmarks of a victorious one. This time, though, their efforts were matched by the result. Liam Gillesphey nodded home in the 31st minute and, even when they had to play the final 40 with 10-men, Mark Collingwood’s side saw the game out assuredly. “It’s got to give us confidence, playing against a team that scored seven past us earlier on in the season”, reflected the manager when speaking to Andrew McDonnell post-match. Signs of the progress his side have made in recent weeks were clear. Consett may have settled better in the early stages, but they were still getting nothing easy. Luke Carr intelligently slipped Michael Mackay through after four minutes, but Scott Young stayed tight to the forward and made an excellent last-ditch block. That allowed the hosts to work their way into the game. After a quarter-of-an-hour, they won the ball high and Robinson found Dan Wilson in the box, but his low-shot was kept out well by the feet of Kyle Hayes. Even with the blustery conditions ensuring the game was often a somewhat scrappy one, The Star were beginning to capitalise on having the wind in their favour. Joe Hailes was next to come close. Hayes had to fling himself to his right to superbly keep out his 20-yard effort in the 21st minute and Robinson tested him with a long-range strike of his own just before the half-hour mark. Gillesphey capitalised on the growing momentum two minutes later, however. Robinson’s far-post corner was perfectly flighted and the centre-half rose highest to head back across goal and into the bottom-right corner. It was a deserved lead, but they only still possessed it at half-time thanks to the impressive reactions of Chris Bannon. The goalkeeper got down sharply to his left in stoppage-time at the end of the half to keep out Mackay’s clever flicked attempt from Darren Holden’s cross. Nonetheless, it looked somewhat bleak for the home side eight minutes after the break when Robinson picked up his second caution and was dismissed for catching an opponent with a firm but fractionally late sliding challenge. The focus, though, only seemed to sharpen in the Seaham ranks. They dug in and Consett’s openings were consequently limited. Their best one fell to Nick Green in the 62nd minute, who could only nod over from point-blank range after Carr’s corner was headed back across goal by Danny Craggs. Another Carr corner, which looked to be creeping in, was punched away well by the impressive Bannon moments later and the ‘keeper again displayed safe-hands when he got down to hold substitute Matthew Cornish’s 25-yard effort in the 70th minute. Craggs may have struck the outside of the right-hand post after he was cleverly found on the edge of the box by Cornish with a little over ten minutes of normal time remaining, but Seaham never truly looked rattled at any stage. They kept their shape and their heads and, despite a couple of decent half-chances for the visitors as the clock ticked down, they saw the game out with minimum fuss. That moved them above Whickham and up to 16th in the division, with Collingwood eager for his side to build on recent displays, and this result in particular, in the weeks to come.